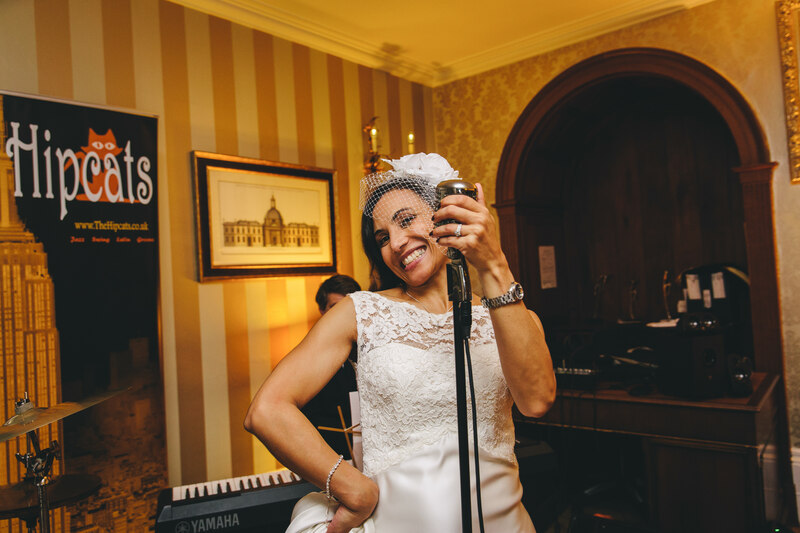 Wedding Jazz Band and Wedding Swing Band - The Hipcats - jazz, swing band and jazz singer for weddings, corporate functions and other events across the UK - based in Bristol, Bath and the south-west. 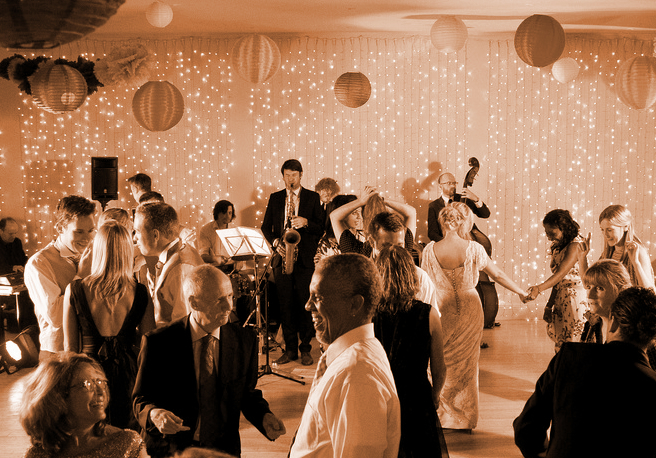 Looking for ideas and inspiration for a wedding jazz band or wedding swing band? - or options for playing MP3s and sorting out lights for the evening for you. Lauren and Ralph decided they wanted The Hipcats six-piece to really get the party going. The band waited for the guests to finish dessert and then set up in around 40 minutes as everyone moved to get coffee and stretch their legs. The first set then started with some laid-back jazz just before the bride and groom had their first dance to 'What a difference a day made' (made famous by Jamie Cullum). They then launched into a classic jazz and swing set which had everyone dancing. This was followed in the second set by a party mix of jazz, swing, latin and funk - the dancefloor was full all night! The bride and groom had also prepared MP3 tracks to play at the end of the evening and has asked The Hipcats to arrange extra equipment and lights for an MP3 disco for the final hour. Hi Nick. Yes I am shouting fabulous. We all loved the set you played for Lauren and Ralph at Matara. Superbly soulful, magically musical - it got people bobbing, swinging, singing and on their feet. Great stuff. Jonathan and Alison (Mother and Father of the bride)"
"You guys were brilliant and really made the evening - thank you so much." Lara & Michael contacted The Hipcats to see if we could sort out a jazz/swing band followed by a disco for their wedding at Clevedon Hall. 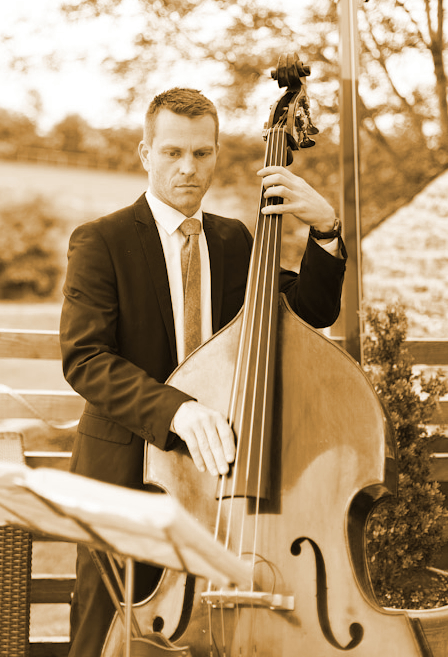 We organised a classic trio which include double bass, piano and vocals and then arranged the disco through one of our trusted partners. The band and the disco arrived, as agreed, at 6.15pm, just as the speeches and dessert had finished. We then set up side-by-side as the guests were relaxing and the band started their first set at 7pm. During the break, the disco played suitable music and the band then played through to just before 9.30pm when the disco took over. "You guys were great, just what we wanted," said Lara. "Hi Nick. So sorry I didn't get to speak to you much at the wedding - was all a bit crazy! We had a great time and everyone really raved about you guys! Think it went down a treat! So just wanted to say thank you very much and I'm sure we will see you again at some point!"